The Eastern Syria insurgency is an armed insurgency being waged by remnants of the Islamic State of Iraq and the Levant (ISIL) and both pro and anti-Syrian government Arab nationalist insurgents, against the self-declared Democratic Federation of Northern Syria, the Syrian Democratic Forces and their allies in the Combined Joint Task Force – Operation Inherent Resolve (CJTF–OIR) coalition. Opposition groups criticized the dominance of the SDF by the Kurdish-led People's Protection Units (YPG) and accused it and the Democratic Union Party (PYD) of displacement and marginalization of Arabs in the areas under its control. Other complaints include a lack of humanitarian attention, conscription by the Self-Defence Forces (HXP), among other abuses. The insurgency began after a series of campaigns in 2016 and 2017 which targeted ISIL's territory led by the CJTF-OIR and SDF, the Syrian government and allied forces, and Turkey along with the Turkish-backed Free Syrian Army. This eventually resulted in the ousting of ISIL from its capital in Raqqa and surrounding areas in the Aleppo Governorate, Raqqa and Deir ez-Zor which were largely populated by Arabs with Turkmen minorities, causing tensions with Kurdish rule and occupation. Multiple factions, made up mostly by Arabs, have formed armed groups in support of either the Syrian Opposition or Syrian Government, with additional ISIL remnants operating as clandestine cells who have emerged in areas captured by SDF and the coalition during the 2016-2017 campaigns. These groups have also utilized guerrilla tactics to target the Coalition and SDF forces. Methods of these tactics include assassinations, hit and run attacks, rocket attacks and use of improvised explosive devices (IED). Locations of attacks vary across cities held by Rojava, but also include Manbij, Raqqah and Hasakah. Several protests have also occurred throughout cities with large Arab populations against Rojava's rule. In November 2017, Harakat al-Qiyam utilized an IED in an attempt to assassinate SDF commander Muhammad Abu Adel leaving him injured in Manbij. On 27 March 2018, an SDF spy was killed by unidentified gunmen, it was alleged that the Popular Resistance carried out the killing. On 2 September 2018, 5 SDF militiamen were killed and wounded by an IED planted in Raqqa. On 31 October 2018, the Turkish military and Syrian Democratic Forces began clashes with stated future goals of a Turkish-led operation in Manbij. The fighting lasted one week, with the United States responding by establishing observation posts in Manbij to prevent further violence. On 2 November 2018, ISIL gunmen assassinated the prominent tribal leader Sheikh Basheer Faisal al-Huwaidi in broad daylight in the city of Raqqa. On 4 November 2018, a car bomb exploded in the city of Raqqa, killing at least one person and injuring 10 more people which included members of the SDF. ISIL claimed responsibility for the attack through its Amaq News Agency. On 26 November 2018, both ISIL and Harakat al-Qiyam claimed to kill a member of the Manbij Military Council named Hamza Zaza. On 4 December 2018, YPG claimed to have arrested 4 members of Harakat al-Qiyam allegedly collaborating with Turkish intelligence. On 12 December 2018, ISIL carried out multiple attacks against Rojava in Raqqa, Manbij and Shaddadi. The attack in Raqqa included the use of small arms and IEDs on SDF fighters, while the attack in Shaddadi was a stabbing. On 27 December 2018, ISIL claimed responsibility for an attack on SDF in the village of Darnaj in the Eastern Deir Ez Zor governorate resulting in the death of 20 fighters from SDF. On 29 December 2018, ISIL claimed to have carried out a series of attacks against YPG positions in the city of Raqqa and parts of the Deir Ez Zor countryside. The attacks included the use of IEDs, small arms and ambushes. On 9 January 2019, "The Gathering of the Eastern Martyrs", a sub-unit of Ahrar al-Sharqiya, claimed responsibility for bombing an SDF humvee with an IED. On 16 January 2019, an explosion went off in the city of Manbij, killing 4 US soldiers as well as fighters from the Manbij Military Council. In total at least 19 people lost their lives. The attack was claimed by ISIL through their news agency Amaq. On 21 January 2019, an ISIL suicide SVBIED targeted a US convoy accompanied by SDF troops on the Shadadi-Al-Hasakah road in Al-Hasakah province, killing 5 SDF personnel. Witnesses say the SVBIED rammed into an SDF vehicle by a checkpoint held by Kurdish forces a dozen kilometers outside Shadadi as the US convoy drove past. No Americans were harmed. On 7 February 2019, the SDF media center announced the capture of 63 ISIL operatives in Raqqa. According to the Kurds, the operatives were a part of a sleeper cell and were all arrested within a 24-hour time span, ending the day-long curfew that was imposed on the city the day before. On 9 February 2019, ISIL militants attacked SDF fighters near the al-Omar oilfield, triggering airstrikes by the U.S.-led Coalition. SOHR said 12 Islamic State fighters attacked SDF and clashed with them for several hours until most of the attackers were killed. 10 attackers were reportedly killed, while 2 managed to flee. Other activist collectives, including the Step news agency, reported the attack, saying some of the attackers used motorcycles rigged with explosives. On 21 February 2019, 2 successive SVBIEDs detonated in the market area of Shahil, Syria - 10 kilometers from the SDF's al-Omar oilfield HQ - killing 14 people. SOHR reported a car bomb that was detonated remotely as a convoy of workers and technicians that worked at the oilfield was passing by. SOHR said 20 were killed and others wounded. Other reports of this attack provided alternate locations of the VBIED explosions, the Northwestern city of Afrin and the village of Ghandura near Jarablus. On 9 March 2019, 8 people were wounded when a suicide bomber blew up a car in Manbij, near a market. The Islamic State claimed responsibility for the attack. On 14 March 2019, the pro-Syrian government Popular Resistance detonated an IED in Raqqa targeting a US military convoy, the group claimed that there were some injuries among American forces however neither the United States or Syrian Democratic Forces confirmed the reports, video footage was released by the group showing the attack. On 26 March 2019, ISIL gunmen opened fire on a checkpoint in Manbij, killing 7 Manbij Military Council fighters. On the same day, ISIL claimed responsibility for 3 separate attacks in Deir ez-Zor. On 3 April 2019, an ISIL cell clashed with the SDF and the Asayish in Raqqa, with 4 ISIL fighters blowing themselves with explosive belts. On 5 April 2019, about 200 ISIL detainees revolted and attempted to escape from Dêrik prison in al-Malikiyah. The breakout was foiled, and some of the prisoners were subsequently distributed to other detention centers. On 10 April 2019, ISIL cells attacked SDF fighters at a checkpoint in rural Deir Ez Zor on the outskirts of the town of al-Shuhayl, the cell reportedly used machine guns and RPGs during the attack, as part of a global campaign launched by ISIL, which the group has called "The campaign in revenge for the blessed Province of the Levant" after losing territorial control in Syria after the Battle of Baghuz Fawqani, which has prompted the group to carry out a series of attacks around the world where the group has a presence, as well as encouraging supporters to carry out lone wolf attacks in their countries, other attacks related to the group's call for vengeance have occurred in Libya and Iraq. 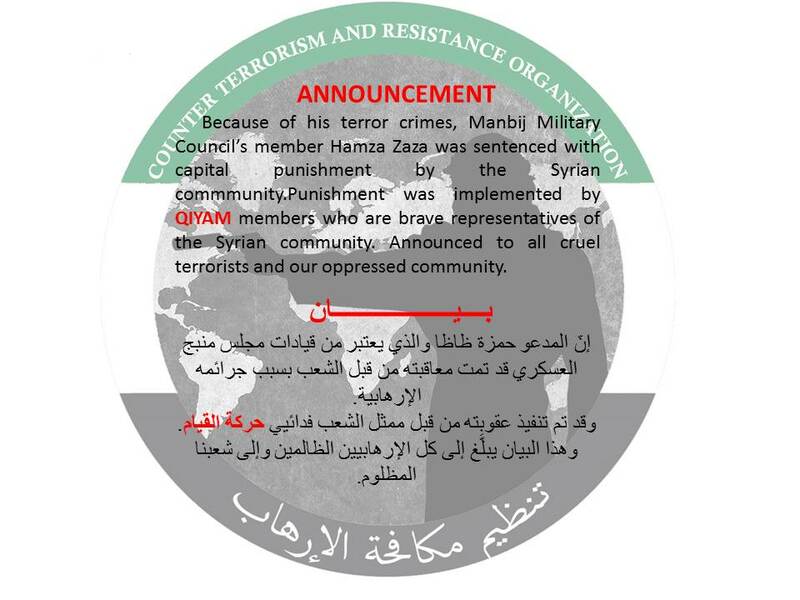 On 12 April 2019, ISIL claimed responsibility for an attack in Manbij against members of the Syrian Democratic Forces. ^ Known as "Democratic Federation of Northern Syria" until September 2018, and as "Autonomous Administration of North and East Syria" afterwards. ^ "Torture-Killings in Manbij Inflame Tensions Between SDF and Local Tribes". Syrianobserver.com. 18 January 2018. ^ "Syrian Arab tribes call on Turkish forces to intervene against Kurdish YPG". Ahvalnews.com. ^ "Syrian tribes vow 'popular resistance' against PKK/PYD". Aa.com.tr. ^ Rashid, Bedir Mulla (2018) [1st pub. 2017]. Military and Security Structures of the Autonomous Administration in Syria. Translated by Obaida Hitto. Istanbul: Omran for Strategic Studies. Archived from the original on 2018-07-01. ^ Osman, Tamer (24 November 2017). "Manbij residents face off against SDF over conscription policy". Al-Monitor. ^ "ISW Blog: Post-ISIS Insurgency Looms in Northern Syria". Iswresearch.blogspot.com. 7 November 2017. 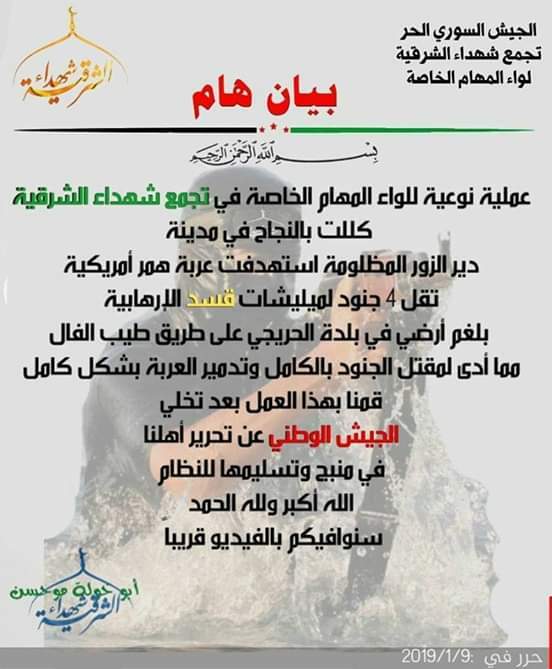 ^ "FSA Qiyam Movement claims the responsibility of them targeting "Abu Adel" the newly appointed leader of MMC in Manbij by an IED". Syria.liveuamap.com. ^ "Raqqa: five SDF fighters killed and wounded in IED". En.zamanalwsl.net. ^ "US to establish observation posts on Syria-Turkey border: Mattis". Rudaw.net. ^ "Prominent Raqqa tribal leader assassinated in attack claimed by IS". Kurdistan24.net. Retrieved 2018-11-02. ^ "Islamic State says hits Syria's Raqqa with car bomb". Euronews.com. Retrieved 2018-11-04. ^ "سوريا: انفجار يهز الرقة والعشائر تدعو إلى مظاهرة غداً". Ammonnews.net (in Arabic). 2018-11-04. Retrieved 2018-11-04. ^ "مقتل شخص وإصابة 10 في هجوم بسيارة مفخخة بالرقة". Dostor.org (in Arabic). 2018-11-04. Retrieved 2018-11-04. ^ "Photographic image". Web.archive.org. Retrieved 5 February 2019. ^ "Photographic image". Pbs.twimg.com. Retrieved 5 February 2019. ^ "Turkish-backed sleeper cells captured by our forces - English". Ypgrojava.org. ^ الفضائية, قناة الجسر (12 December 2018). "#تنظيم_الدولة: قتلى وجرحى من "ب ك ك" بكمين في مدينة #منبج". Twitter. ^ الفضائية, قناة الجسر (27 December 2018). "تنظيم الدولة يعلن مقتل نحو 20 من "ب ي د" بدرنج شرق #ديرالزور أمس". Twitter. ^ Zachary Cohen, Veronica Stracqualursi and Kevin Liptak. "4 Americans killed in Syria attack. ISIS claims responsibility". Cnn.com. Retrieved 3 February 2019. ^ "Blast claimed by Islamic State kills U.S. troops in Syria". Reuters.com. 16 January 2019. Retrieved 3 February 2019. ^ "Suicide attack on Kurdish-US convoy in Syria kills 5: monitor". Arab News. 21 January 2019. Retrieved 3 February 2019. ^ "Two car bombings in Syria kill at least six - Breaking News - Jerusalem Post". www.jpost.com. Retrieved 2019-04-03. ^ a b "Syria: VBIEDs kill six people in Aleppo province February 21". GardaWorld. Retrieved 2019-04-03. ^ "The Latest: Back-to-back suicide car bombs kill 14 in Syria". Fox News. 21 February 2019. ^ "ISIS claims bombing in Syria's Manbij which left at least eight casualties". Kurdistan24. Retrieved 2019-03-09. ^ "Suicide bomber strikes Syria's Manbij, injures 8: MMC". Rudaw. Retrieved 2019-03-09. ^ "Mysterious pro-gov't group allegedly attacks US military convoy in Raqqa (video)". Al-Masdar News. Retrieved 2019-03-23. ^ "Daesh militants kill 7 US-backed fighters in Syria: commanders". 26 March 2019. ^ Georges Brenier (11 April 2019). "INFO TF1/LCI - Syrie : des cadres français de Daech impliqués dans une mutinerie". LCI. Retrieved 12 April 2019.